Do you look around one day and all of a sudden you see something that you never saw before and wonder where in the world has your brain been. When we moved in after doing a little mini makeover to the kitchen, I added handles to all the kitchen cabinets and knobs to the bathroom cabinets. I thought I was all done and gave all my extras away. Well 4 yrs. later, I just noticed that the laundry room cabinets don't have any knobs on them. As you can plainly see, I am always totally observant - - -NOT. 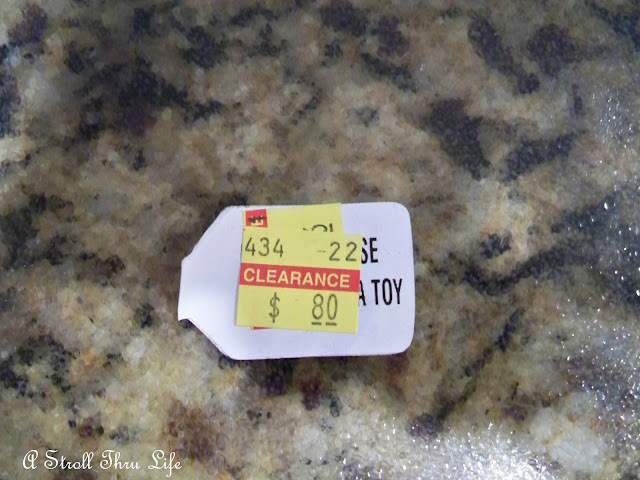 So on a recent trip to Hobby Lobby I happened to see some knobs in the clearance aisle and it reminded me that I needed some, so I went through their bins and you will never believe what I found. There are 4 doors on the cabinets above the washer and dryer, so I thought this was perfect. Sometimes you just have to be a little silly and do something totally fun. I was so thrilled that I found the letters to spell "Wash". The added bonus is they were on clearance for 80 cents each. How could I possibly resist. My laundry room is just a pass through from the hall to the garage. As you walk in there is an old refrigerator that I love having. Holds some extra freezer things and perfect for all the juices and drinks, plus extra room when we have company and big meals. Next to it is the washer and dry. (I know, they are older too, but they work so beautifully and with just 2 they don't get a huge workout.) The storage above them is fabulous, keeps all those necessary things out of sight. The other side has room for a small cabinet with two doors and two drawers at the bottom. This holds some of my candlesticks, candles, sewing machine, sewing notions, ribbons and wrapping supplies. Of course I use every square inch in here to decorate and to also hold some of my "stuff" when I'm not using it in a vignette. 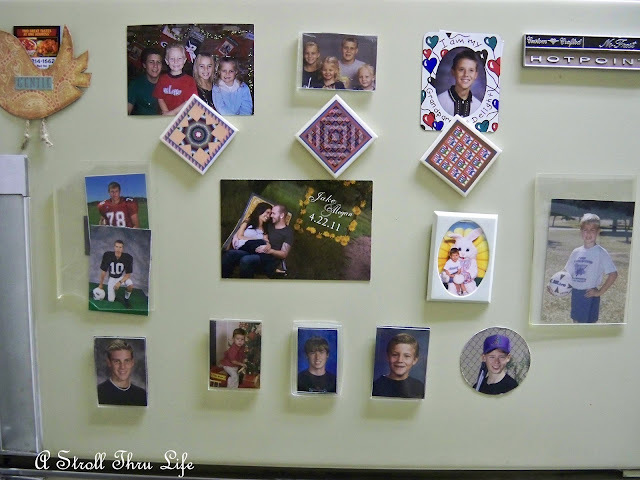 My bragging wall with pics of my grands. These are all when they were really little, they are all grown now. See the two football players on the left and the soccer player on the right, that's one of his wedding pics in the center 4-22-11. Time flys. 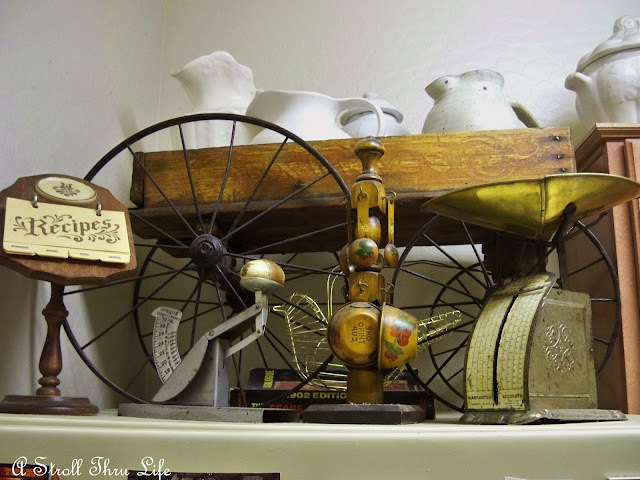 The top of the fridge holds my Antique Radio Flyer wagon and some of my extra pitchers. I love these two antique scales too. 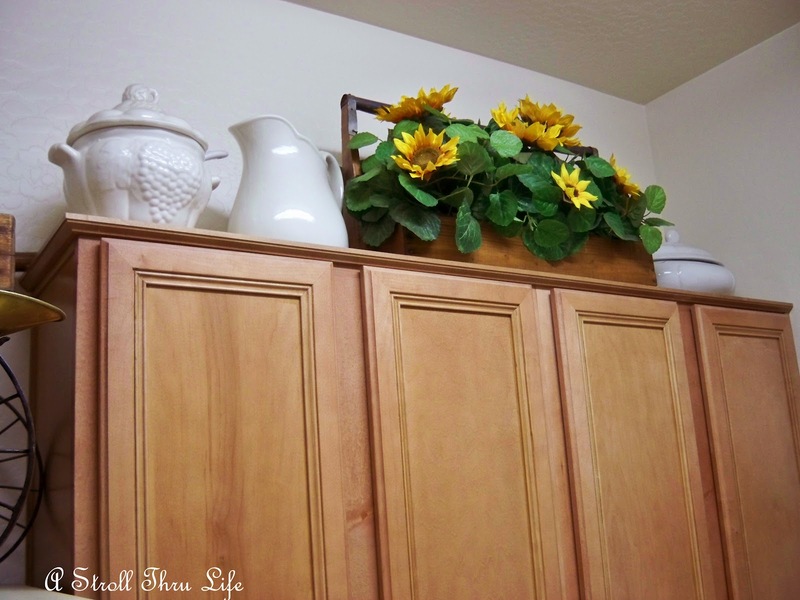 The top of the cabinets holds two tureens, my mom's ironstone pitcher and my dad's toolbox. Now look at the cabinet doors with my fabulous find. Don't you just love it. So fun. 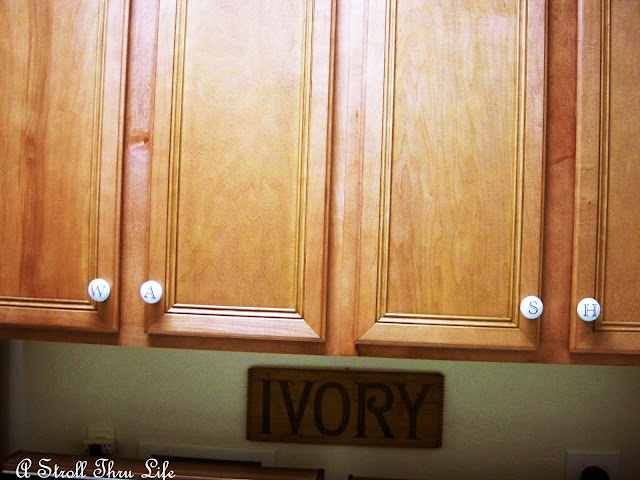 Under the cabinets is an old Ivory panel off one of their shipping crates. Cute - I know, simple things really tickle me. I have a few of the quilt blocks and needlework pieces that I did many, many years ago. Still think they are fun. Nothing fancy, but it is great to have some decor even in the laundry room. The top of the cabinet holds a small collection of old irons and some of my dad's old woodworking tools. 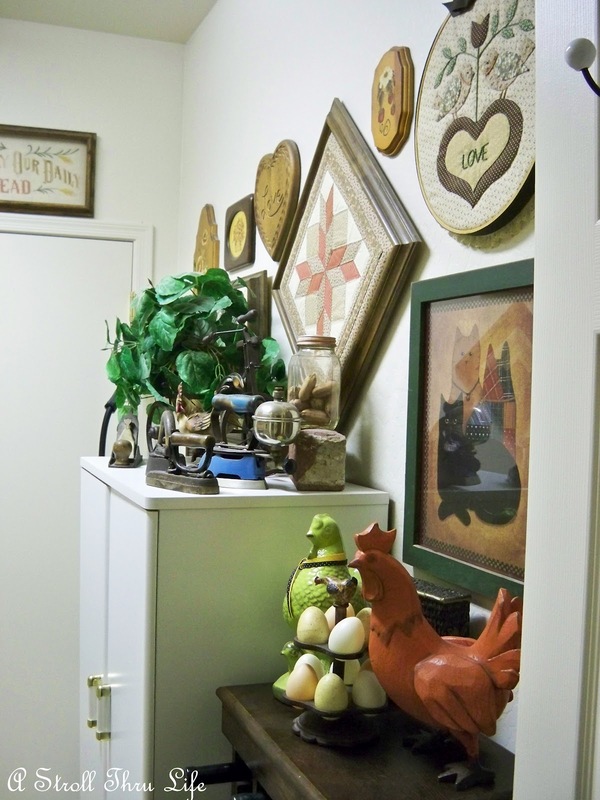 Love the new knobs, the vignettes and the items from your mom and dad! 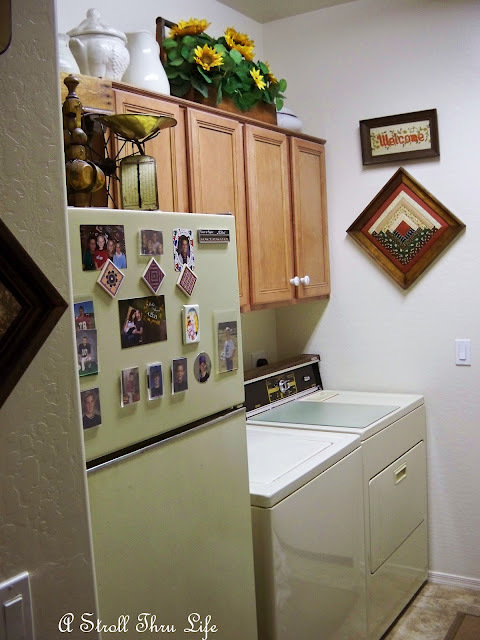 Your laundry room is a treasure trove! 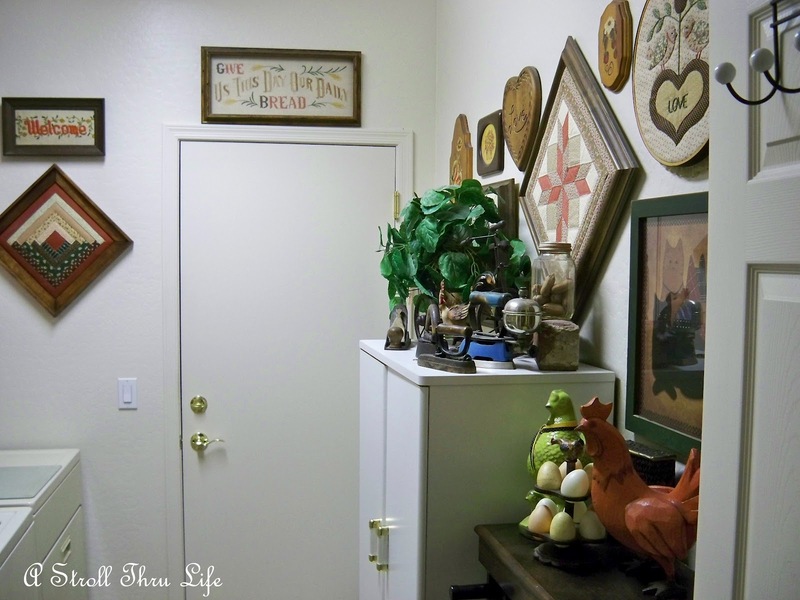 It's a great place to hold all of your pictures and pieces for when you change out a room! LOVE the knobs, what a cool idea! My laundry room is in the basement of this old house of mine. There is no hope for it. I'm happy just knowing it's clean! lol! Have a great week, Marty! Love the knobs and vignettes. So cute as always Marty! I love that you have kept some of the old decor from the past country craze. What a fun space, Marty! How have I missed this before?! 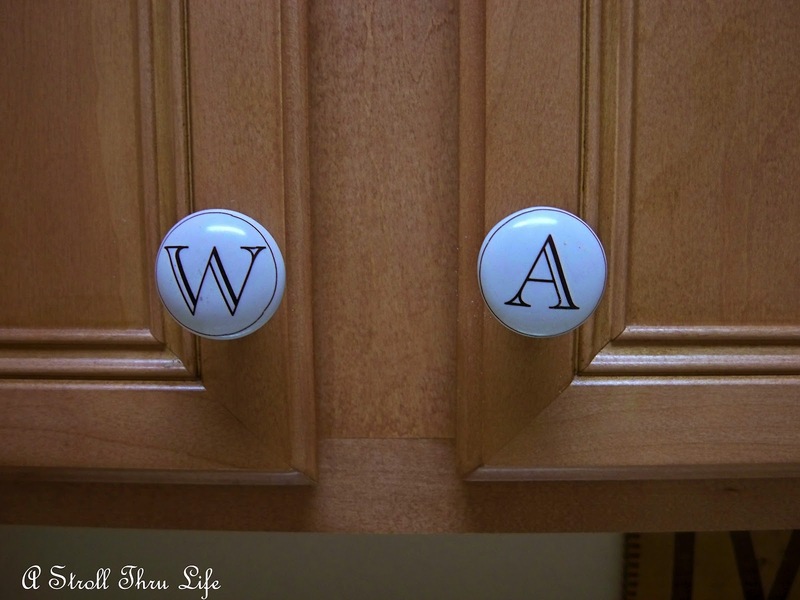 And, what a genious idea using the knobs that spell out "WASH!" Fantastic! I love your laundry room. Hubby is going to build me one next year. Right now can you believe that my washer and dryer is in our kitchen. Thats an old house for you. Marty, a mi también me gusta su cuarto de lavado, y esos botones encajan a la medida que suerte de encontrarlos. Saludos desde Costa Rica. You scored big time Marty, I was looking for those but didn't see them, I'm just glad I got to see HL for the first time. 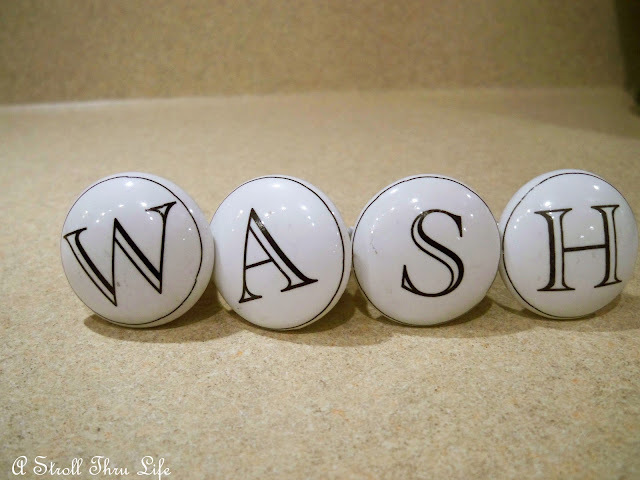 They look adorable on your cabinet doors and love how they spell WASH couldn't be more appropriate! Wow Martha! Your laundry room is full of treasures!! Love them! especially the old irons and your dad's working tools! Cute knobs. What a cute laundry room! I love the new knobs, too. Awesome as always, Marty. I LOVE those knobs!!!! So much character in on tiny little space. Love the new knobs. So cute. Love the knobs. And, all the old things that you have so cleverly displayed. Thanks for sharing. Very cute! I always forget that Hobby Lobby sells cabinet hardware. It's amazing how just adding something as small as that can give your room an extra lift. So cute! This is a great idea- amazing find! How adorable is your wash! just the right number of cabinets. I love a laundry room, we grew up with one and it was a great place to shut the door! but yours is pretty enough to keep the door open. Oh I love everything in there ! Such a nice laundry room ! You have done it now girl lol .I showed Papa and said I want my laundry room bright now just like this one and showed him your awesome photos lol . HAHA I have been wanting to redo my laundry room for some time now it is dark panelling and I dont like it we have only been here for 3 years time for it to change . I thought of painting over the panelling I have seen that done and it looks great dont want to take away from the old farm house look in any room just give it face lift ! Love the find of the knobs they look cute ! I just love good finds ! Have a great day ! Love your W A S H knobs. Very cute and perfect for your pretty laundry room. Love that vignette with the wagon and cream ware, scale and other treasures!! cute room. What a sweet touch to the doors. 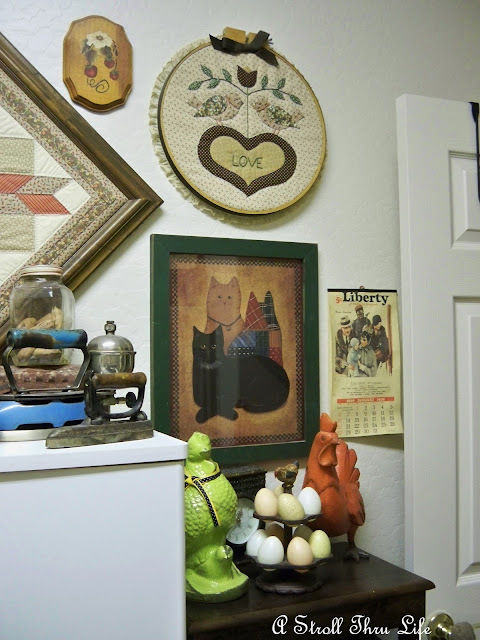 Your laundry is such a light and bright space, love the family pieces and stitching. A job well done! I love your laundry room, it's bright and cheery and you have it decorated so wonderfully! Mine is in our dingy basement...me not like. Hugs and see you soon! Those knobs are super cute and the price can't be beat. What a fun addition to your laundry room. Great idea Marty and fabulous price! Thanks for sharing, now I've got to go figure out something to spell on my cabinets. So clever Marty! Love this idea!! This is such a cute idea. I love things like this. Not too much silliness - just enough. I'm going to create a craft room for myself, one of these days. When I do, this will be part of the plan. Love your new knobs...they are so cute! Well Marty, even your laundry room looks cozy! I love the knobs. What a great idea! I love, love, love your WASH knobs in your laundry room! 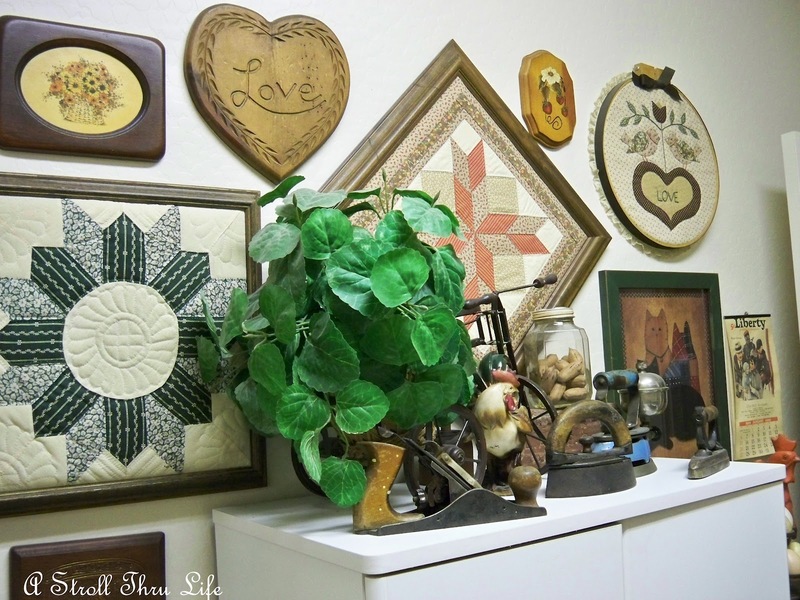 The decor is so precious, and spans your familys generations with heirlooms and grands! A FUNctional and Fun room!Delightful! Looks great! Don't you love it when something so simple makes a great impact? These certainly do, great job. I love those knobs. I am redoing my laundry room this week as we speak. A lot more involved than I had intended it to be. Those are cute, Marty. That is funny that you are just now noticing missing knobs. Sounds like something I would do for sure. What a creative way to add some whimsy! You have so many great things in your laundry room. I love the pictures, the scales, the old tools, etc. I knew the WASH was going in the laundry room, I just didn't know where! Cute!!! Aaaa too cute. You always have a way with display!! LOVE your knobs!! What a fantastic idea and such a great price. Your laundry area is decorated so lovely... Have a super rest of the week! Love your laundry room, everything is beautiful which must make doing laundry there way more fun!! Those lil knobs are just the cutest, what a great and fun idea! So neat that you have your dads tool box and some of his tools, and pitchers and things of your Mom's as well. One of the nicest laundry rooms I've seen!! Oh goodness, Marty. Your laundry room has more style than my living room! I love it, and I really love the knobs. That's adorable. I want to copy cat that. "Laundry Lady" (meaning that cute for sure) I love the knobs! Makes It! I also love the wagon and can see it on the porch filled with wrapped presents at Christmas or Geraniums for Summer or in the bathroom stocked with rolled towels and bath delights-it is so adorable. Those knobs are the cutest ever! LOVE! Those knobs are perfect! Your laundry room is beautifully decorated, I've got some work to do before I show mine! Hope you're having a great week! Very nice..Love the knob idea...cute. What a great find and so cute in the laundry room. Looks so pretty with all your collectibles! What a great find..and I Love the price too! Adds the perfect touch to your laundryroom. Love those knobs. And, love your laundry room. Mine is in sore need of redecorating. It's on the list. I love your laundry room! It has a wonderful comfy feel to it. Those knobs are fabulous! It's little finishing touches like your knobs that really make a home special. I love going to show houses to look for details like that. Marty, those knobs are so pretty!!! What a great idea! I love your laundry room and I love the wall with all the pictures of your Grandkids! I really like the WASH knobs, Marty. What a great deal. The wagon on top of your 'fridge is just too cute. Spelling WASH was a great idea! Too cute. 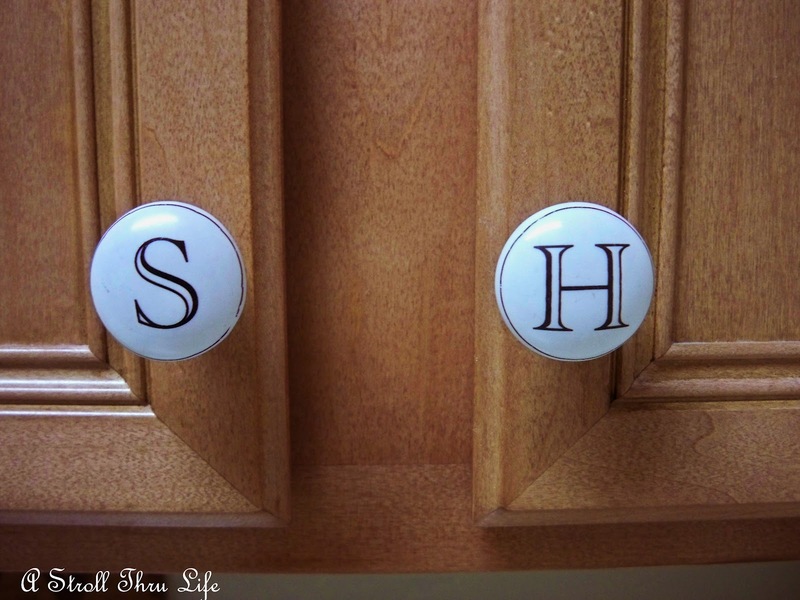 I love the new knobs for your cupboards in your laundry room. Very pretty accessories! Hope you will visit Magnolia Cottage. What a great find and bargain! !...I have been eyeing the lettered knobs at Anthropologie for my laundry room...but will need to check out Hobby Lobby! !